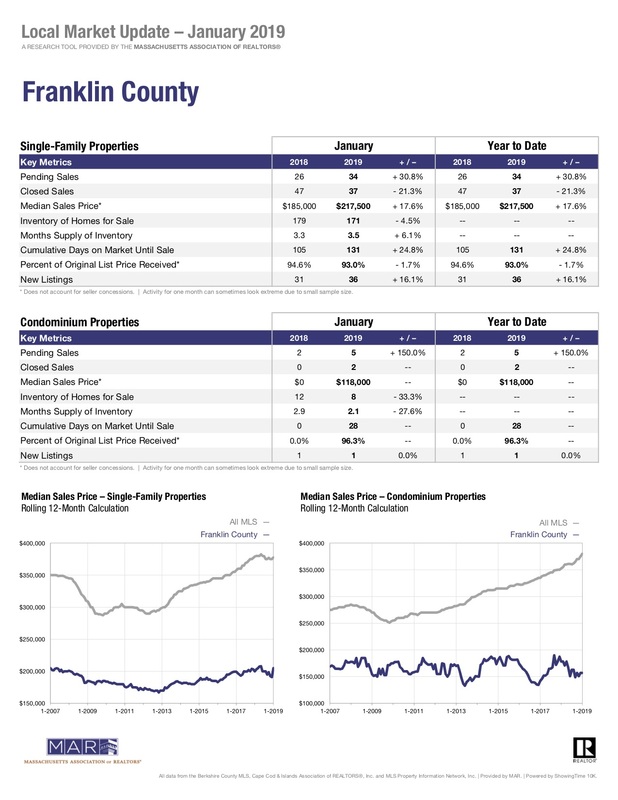 Franklin County sales were down 13.1% and the median price was down 13.1% in October, 2017 compared to October, 2016. The sales and median price was up in Hampshire and Hampden County. I anticipate a reduction in the number of sales as we approach the winter season. The inventory of homes for sale is low which means it is a great time to keep your house on the market. Your house will stand out more because there is less competition on the marketplace and buyers do purchase homes during the winter months. 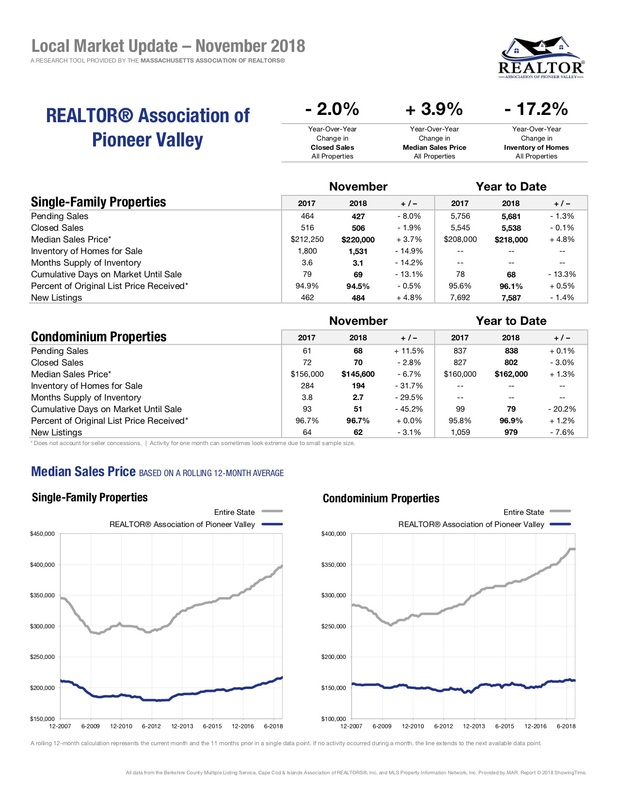 The following reports will be posted monthly keeping you informed of the local real estate market. Sales—Up 20.6 percent from 432 in October 2016 to 521 in October, 2017. Median Price— Up 6 percent from $194,000 in October 2016 to $205,550 in October 2017. Inventory of available property—Inventory fell 24.7 percent from 2,303 single family listings at the end of October 2016, to 1,734 single family listings at the end of October 2017. Supply—The supply of single-family properties on the market at the current rate of sale dropped 28.9 percent. At the end of October 2016 there were 4.9 months of supply at the current rate of sale. 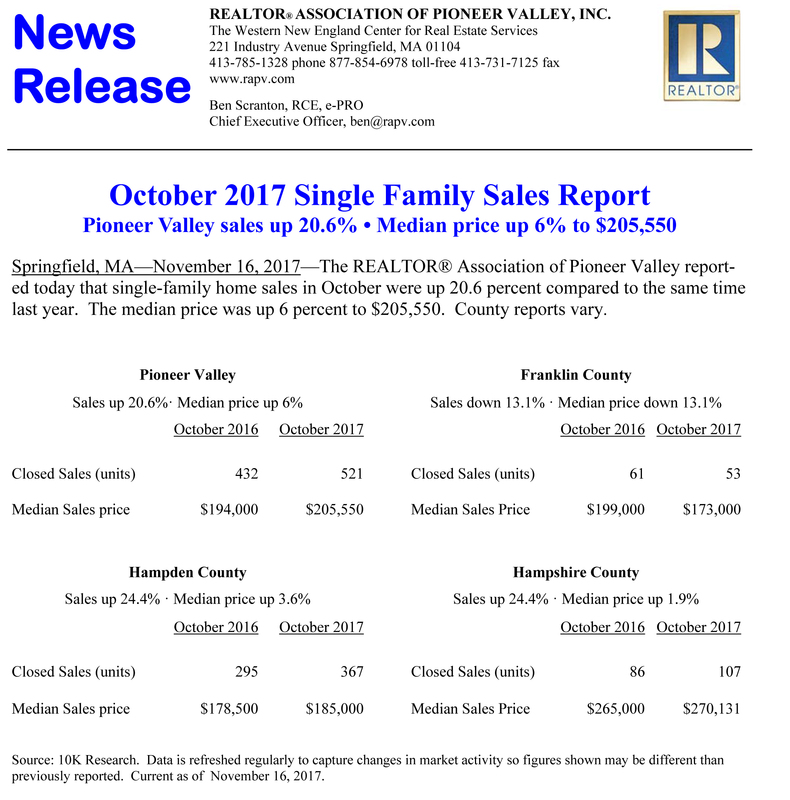 At the end of October 2017 there were 3.5 months of supply at current rate of sale. Days on Market—The average days on market dropped 21.2 percent from 81 days in October 2016 to 64 days in October 2017. Pending Sales—Listings which are pending (under agreement to sell) are up 21.1 percent from 475 in October 2016 to 575 in October 2017.